I love puy lentils and we eat them a lot. Boiled simply and then flavoured with oil and fresh herbs while still warm, they are endlessly versatile and often form the basis of a quick, week-night dinner. What we don’t often do is cook them with other ingredients as part of a one-pot dish. Cooked this way (braised I suppose), the lentils took on more flavour and the texture changed too, becoming almost creamy. It took a little longer this way but we were rewarded with a completely different dish and a whole new way to enjoy lentils. The other thing I particularly liked about this was the mustard. It’s the second dish I’ve cooked recently that uses a lot of what I mostly use as just a condiment. I’m definitely converted to cooking with mustard instead of just spreading it on my ham sandwiches and am looking forward to experimenting further. Start by browning the seasoned chicken until it’s very dark all over and then remove to a plate. In the same pan, remove the excess oil and then fry the bacon pieces until the fat has rendered. Remove to a plate. Again, remove the excess oil and then soften the onions, celery and carrot. After about five minutes at a medium heat, add the garlic and cook for a couple of minutes. Next, add the herbs and the black pepper and cook for just a minute. Return the bacon back to the pan and then add the wine, allowing it to bubble for a couple of minutes so that the alcohol burns off. Now add the lentils and stir them around so they are well incorporated with everything else. Add the chicken stock and mustard and stir again. 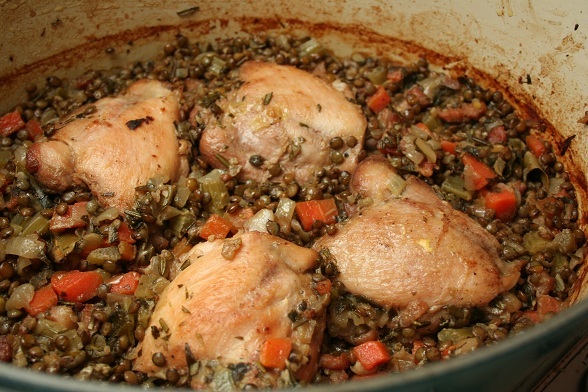 Sit the chicken on top of the lentils and put the pan into the oven for about 35 minutes (this will vary depending on the kind of chicken you’re using and whether it has bones). Check to see if you need to add any salt, add a squeeze of lemon juice and the parsley and then serve. Subscribe to comments with RSS	or TrackBack to 'Chicken with Mustard Lentils'. I do something (a bit) similar with sausages, using cider instead of stock. Sometimes some chopped-up chorizo, instead – first checking that I have some sherry left! Them there Puy lentils are ingredients t’savour. They hit the Top Five in the Comfort Food charts, too (not t’mention being an effective hangover-supressant) when mixed with nothing more than some lemon zest & juice, a handful of chopped parsley and plenty of EVOO. BTW – Try yer chicken thing with wholegrain mustard instead of the Dijon, maybe adding some chili with the garlic: a different, mellower kind of depth, I reckon. This looks great. I’m not really a big fan of lentils and am trying to wean myself onto them – I think I might like them cooked this way as part of a one-pot dish. I love mustard in cooking too so will bookmark this to try at some point! Thanks, Steve. I love the sound of the lentils with sausage and am intrigued by the hangover suppressant suggestion too. Lots of good ideas there. I hope you like it, Antonia. I think the fact that the lentils take on a creaminess might win you over.